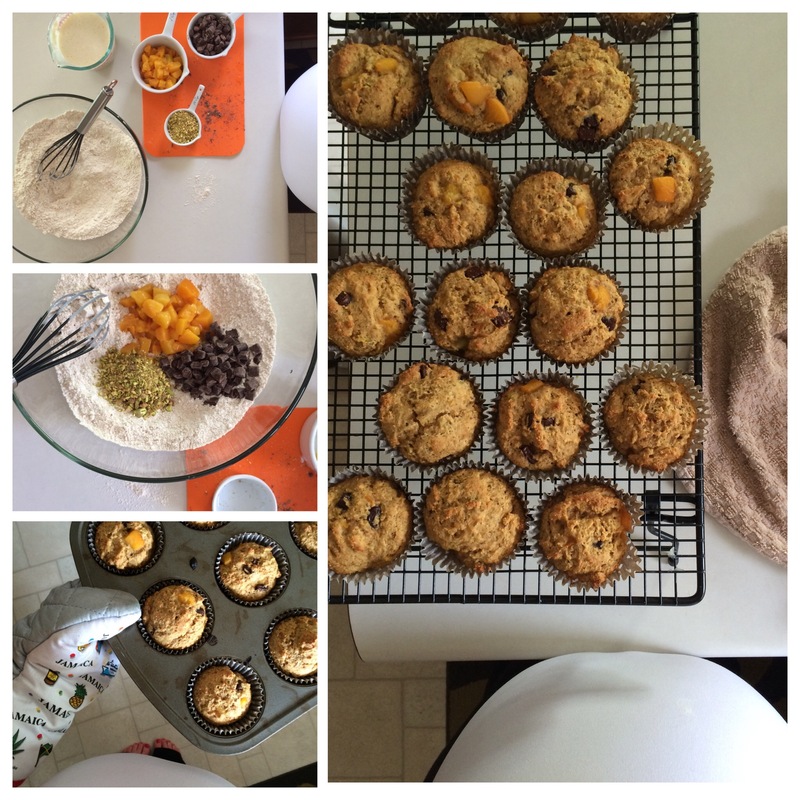 Apparently it’s been ten weeks since my last full fledged pregnancy update. Not that I’ve really been talking about anything else here, but for memory keeping’s sake, let’s get to an update! Babies: Babies are said to be 3.3 pounds, or the size of four navel oranges, this week. I have a sneaking suspicion these babies weigh a bit more and I think it’s safe to say it feels like I’ve got eight navel oranges (constantly) moving around in there. Perhaps eight grapefruits is even more accurate. We’ll learn their weight at my ultrasound later this week. Apparently they are starting to fatten up and fill out at this point too. I have no doubt that they are filling out juuuust fine. Did I tell you about my mom’s friend that was an 8 lb triplet? Eight. Pound. Triplet. I’m feeling and seeing these babes move around constantly and it’s just so freaking cool. I often wonder what in the heck they are doing in there, and also wonder if they are communicating somehow. When they are quiet, I can’t help but think they’re already plotting against me somehow. Like, making plans for the terrible twos, or even worse, the terrible teens! How am I feeling? Eh. I have my days. Mostly I feel grateful, lucky, hashtag blessed. But I’d be lying if I failed to mention that I also feel exhausted, uncomfortable, and incapable of ordinarily simple tasks at times. Every little thing that involves movement gets more difficult by the day. Getting out of bed. Putting on socks/shoes. Walking. Washing the dishes (belly really gets in the way). Doing laundry. You get the idea. Happy or moody most of the time? It’s funny, looking back at my 21 week post, I mentioned feeling emotional. It definitely subsided for awhile but seems to be back again. I’ll be the first to admit I’m irritable and not always my usual chipper self. It’s not because I’m not completely and utterly excited for what is to come in our very near future, it’s just that growing babies is tough work. And sometimes it gets the best of me. Over the weekend I did some baking and got so excited about the idea of being in the kitchen with my littles someday, teaching them how to measure flour and keeping them happy with 1/4 of brown sugar like my mom always did for me when she baked. Total weight gain: More than thirty pounds. I’m not sure exactly how much more and I’m not concerned. At my most recent prenatal visit my doctor told me I was “doing a great job”. At the appointment before that he said I should “watch the weight a bit”. At that same appointment he forgot there were two babies until I reminded him that he neglected to get a heartbeat for Baby B. As you can imagine, I was not happy. This past appointment was much better and he commented that my weight is well within the healthy range, based on my pre-pregnancy BMI and the fact that I’m carrying twins. Maternity clothes? Pretty much exclusively so. With the exception of non-maternity maxi dresses purchased a size or two too big. I also accidentally discovered that fold-over yoga pants worn backwards and unfolded make for pretty great maternity comfies! Sleep: Let’s not talk about it. It’s worth mentioning though, that it doesn’t seem to be my active babies that are keeping me up. I wake up due to acid reflux, mostly. But also because I have to pee. And also for reasons unbeknownst to me. I’m just. Awake. More often than not. But for the most part the babies are quiet during normal “sleep hours”. They move around a bit, but not enough to keep me up. Miss anything? My ankle bones. Unlimited caffeine. Moving around quickly. BEER. Cravings: Ice cold drinks/anything slushy. Carbonation. Cereal -both with milk and by the handful right out of the box. Strawberries. Golden Oreos, always. I’ve also been on a little peanut butter kick as of late. Stretch marks? Still none. Still knocking on wood. Belly button? As I type, it’s neutral. Neither in, nor out. That said, I think it’s about to see what life is like as an outie aaaaany day now. Wedding ring? I stopped wearing that long ago. Swapped it for a fake a few months ago. I wear it sometimes. New items for babies? Tons of them. My baby shower was a few weeks ago, followed by a surprise shower my coworkers threw me. 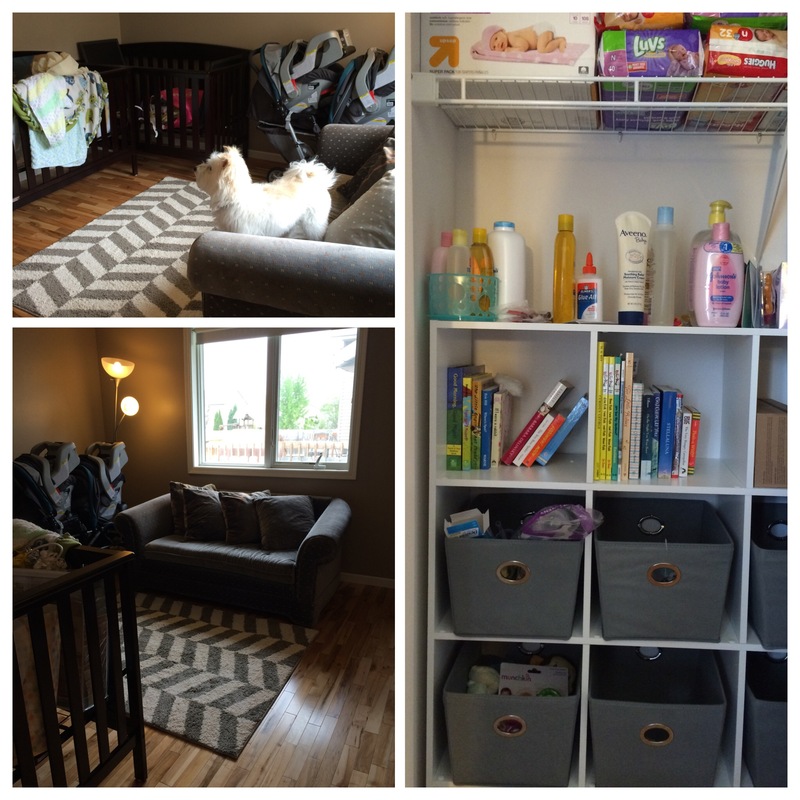 We’re nearly set on baby necessities, now it’s just a matter of getting everything organized. Symptoms/sickness: Still acid reflux. Still minimal sleep. Swollen feet and ankles. The swelling is not only unattractive and inconvenient, it’s actually painful at times. In a tingly sense of the word. 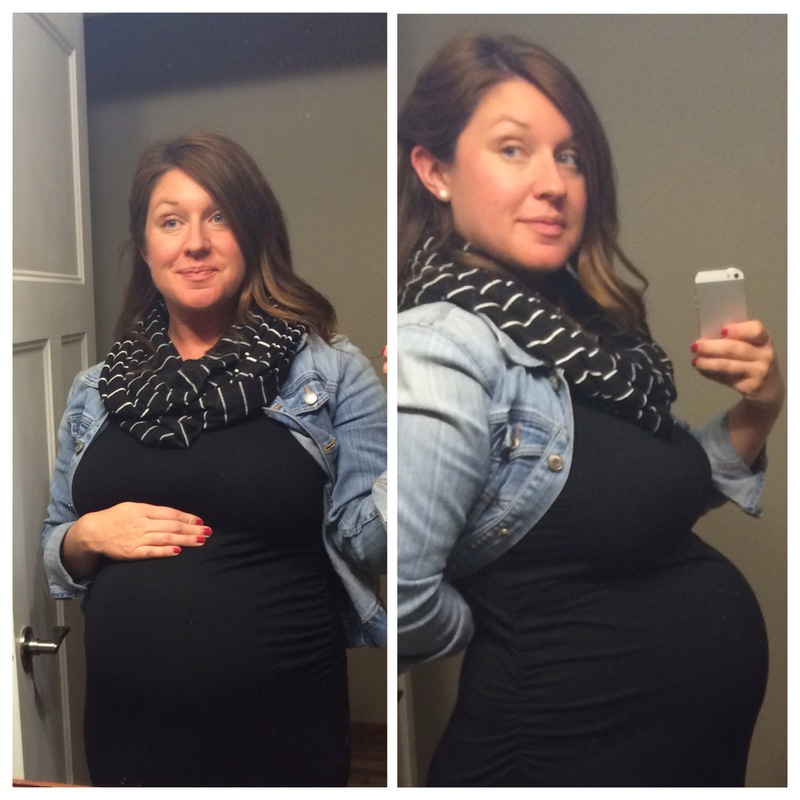 I’ve encountered a bit of Braxton Hicks contractions but they’ve been very sporadic. I have a major case of heavy belly and sometimes when I walk it feels as if they’re going to just fall out with every step. Food aversions: None, really. I have been trying to avoid reflux “trigger” foods but that’s out of desperation, not because I don’t want them. Sunday marked my last day at my second job and even though the last few shifts were tough, I kind of miss it already. Oh, I didn’t tell you I’ve been a weekend warrior for the past few months? Yeah, apparently the financial fear that goes along with expecting twins makes you do crazy things like work 14 days straight until you’re 31 weeks pregnant with twins. Really, the money was completely worth it and it provided me with a social life that involved making money instead of spending it. A win win! you look amazing. i cannot believe that you are already 31 weeks, it seems fake. you hit the nail on the head with the whole “not being able to wash the dishes”….i remember being so freaking frustrated that i couldn’t wash dishes with my belly, and now i’m like, “why didn’t i embrace that?? all i do now is wash dishes!”. p.s. look for a little something on your doorstep sunday or monday…. Today I found out there’s nine pounds of combined baby in there which seems like pure craziness. I’m sorry for all the discomfort, but you’re doing a GREAT job growing those babes! Best of luck to you all! Thank you! I tried my best to keep them in, but at 34 weeks they were ready! Our two boys are now two weeks old!